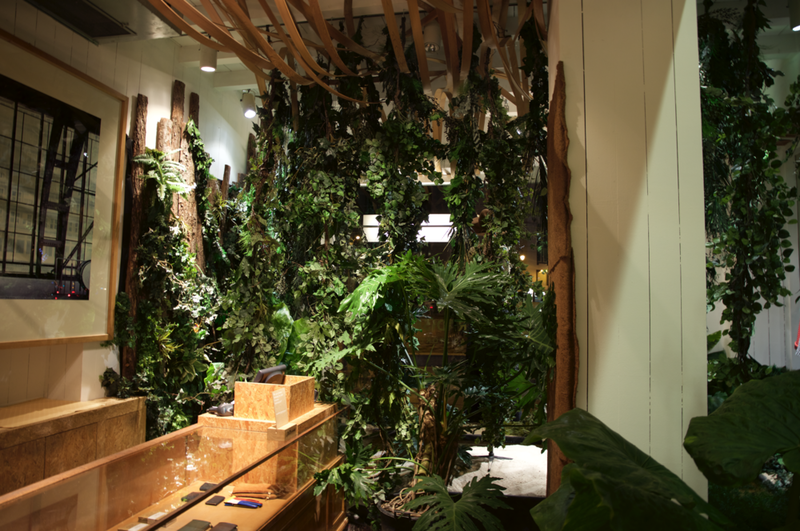 Our new window display, called "Stuck in Paradise", takes you on a journey into the jungle. At Bellerose, we like having original Christmas displays which tell their own story and let people dive into a new universe. We like catching people's attention, making them question what they see and, above all, providing them with an attractive experience. For us, this display was a risky move ! In the 90s, shop displays used to be insanely creative. Their goal was to convey deep emotions. Back then, it was pretty much the only method of communication for brands whereas they are more focuses on digital promotion these days. At Bellerose, we decided to keep insisting on this emotional aspect. We are inspired by America's and Japan's excessiveness to create extraordinary projects. We love using our ideas to make people tick. This is where this story started: instead of Christmas trees, reindeers and frost, we decided to include tropical plants, crocodiles and a desert island in our Christmas window display. Lost in the middle of the jungle, a woman is trying to keep her favourite bag next to her all while fighting crocodiles who are dying to bite it off ! To create such a window display, one needs creativity and inventiveness. Technically speaking, it definitely wasn’t easy to build an island and feature actual water and sand on the ground floor of a manor house. The building’s structure had to be strengthened through the cellar and we had to install a pump to provide the fountain with water. When building a window display, you constantly have to come up with creative solutions. We are already looking forward to presenting our next project in mid-January and in the same venue: our Bellerose shop on Place Stéphanie in Brussels, where you’ll find our “Fight for Spring” display. Who knows, our adventurer might have found a way to tame these crocodiles by then…!